Four faculty members at Indiana University East have received grants for research projects and course development. The awards will be presented during the Faculty & Staff Annual Award Ceremony on March 28. Indiana University East will host a Legislative Forum from 8-9 a.m. on Friday, January 25, in the Whitewater Hall Lobby. The forum provides an opportunity for the community to have an in-person discussion with Senator Jeff Raatz and Representatives Tom Saunders and Brad Barrett. Indiana University East is pleased to welcome a new faculty member to the School of Business and Economics. 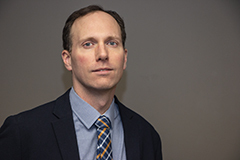 Bret Bogenschneider, assistant professor of accounting and taxation, received his Ph.D. in International Business Taxation from Vienna University of Economics and Business in Austria. He also received his Masters of Law in Taxation (LL.M.) from Temple Law School in Philadelphia, his Juris Doctor from Penn Law in Philadelphia and his Bachelor of Arts in Economics and Philosophy from Knox College in Chicago. For Indiana University East the past year has brought many celebrations, accomplishments and memorable moments. As we begin the new year, IU East reflects on 2018. IU East welcomed its largest, most diverse incoming class and increased its fall headcount enrollment in August. 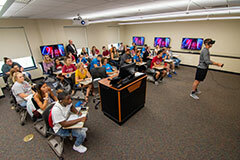 The campus recorded a fall headcount enrollment of 3,722 students (an increase of 6.6 percent). Indiana University East has awarded $1,670,486 in donor-funded and merit-based scholarships to incoming freshmen and returning students for the 2018-2019 academic year. To celebrate the rich history of philanthropic support at IU East, a listing of many of the campus’ donor-funded scholarships with this year’s student awardees is below. 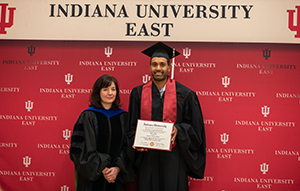 Rajeev Ram was presented with his Bachelor of General Studies degree with a concentration in humanities and social sciences at Indiana University East on Saturday, December 15. Michelle Malott, executive vice chancellor for Academic Affairs, presents Rajeev Ram with his Bachelor of General Studies degree. 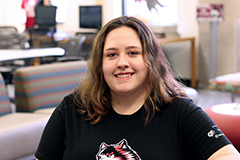 Brittany Yoder, a senior communications major, received a Distinguished Alumni Service Award (DASA) Club scholarship, presented by the Indiana University Alumni Association in Bloomington October 11. Noah Fox and Natalie Peer are the 2018 recipients of Paul and Pat Lingle Scholars Program. The scholarship award will continue throughout their pursuit of a four-year degree at Indiana University East. The need for change has become a creed for change at Indiana University East. Senior Lecturer Tim Scales and IU East student Josh Powell, a sophomore informatics major, demonstrate how to use the Virtual Reality system in the Chancellor Kathryn Cruz-Uribe and Eugene Cruz-Uribe Interactive Classroom located in Springwood Hall.